The emblem used for Acura products tells you all you need to know. The emblem is a stylized set of calipers, suggesting precision, strong engineering and performance and painstaking accuracy in everything. And that, dear readers, is all you need to know and remember to appreciate some of the most interesting cars and crossovers on the planet. Acuras are generally strong performing and handling vehicles with strong biases toward having the latest and greatest technology on board. They haven't always been a the head of the styling class, but that's changing dramatically. Have you seen the ZDX crossover and the TL? Wow! They're aythiong but dull, and many of us think they look terrific. The biggest changes this year have been conferred on the TSX, which gets an all new station wagon for 2011. "The TSX Sport Wagon represents a smart choice for those seeking a vehicle with utility," said John Mendel, executive vice president, sales. "It's practical, fun to drive, luxurious and technically advanced, all while achieving an outstanding estimated highway fuel economy rating of 30 miles per gallon." The TSX Sport Wagon delivers flexible utility and generous interior space- perfect for those with a growing family or an active lifestyle, Acura officials say. The TSX Sport Wagon has an innovative and highly functional rear cargo space that includes a removable side panel to accommodate wider items such as golf clubs and integrated under-floor bins for hidden storage. 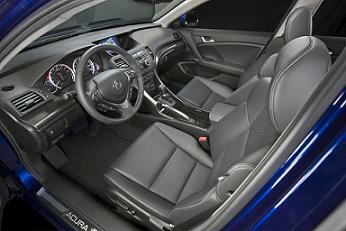 The TSX Sport Wagon has a cabin with seating for up to five adults. The TSX Sport Wagon is a pretty sleek and elegant set of wheels; you'll certainlyknow that it's an Acura TSX when you see it. It has prominent wheel arches around 17-inch, 5-spoke aluminum wheels, and it has a well-defined, blade sharp body and sloping roofline. Powering the TSX Sport Wagon is a 2.4-liter, DOHC i-VTEC®, inline four-cylinder engine paired with a Sequential SportShift 5-speed automatic transmission fit with steering-wheel mounted paddle shifters. The engine gets about 30 miles per gallon on the highway, making the TSX Sport Wagon one of the more economical models in its field. You'll be able to get a hard disk drive-based Acura Navigation System™ with an all-new 8-inch full VGA high-resolution color display and AcuraLink Real-Time Traffic and Weather™ featuring radar image mapping, if you so desire, and for music lovers, look for an optional ELS Surround® Premium Audio System and a hard disk drive (HDD) for media storage. Standard equipment includes a power glass moonroof, dual-zone automatic climate control, leather seats, a premium sound system, Bluetooth® HandsFreeLink®, and USB port and AUX jack music interface. The TSX Sport Wagon will come with a comprehensive list of standard safety features, including Acura's acclaimed Advanced Compatibility Engineering™ (ACE™) body structure. MDX The 2011 MDX , Acura's luxury crossover, now has the brand's trademark hawk-like grille, a new front fascia and rear fascia with integrated polished stainless-steel exhaust finishers, sleek taillights with bright LED lights, and bold 18-inch diameter 5-spoke aluminum wheels. An available Advance Package (with items such as the Active Damper System and 19-inch 7-spoke aluminum wheels) further enhances handling while retaining the comfortable, quiet and controlled ride quality expected of a luxury vehicle. Inside, the 2011 MDX offers leather-trimmed seats, a thick sport-style steering wheel with racing-inspired paddle shifters, bold design gauges and available ventilated front seats. In addition, a host of driver relevant technology is available including AcuraLink® Satellite Communication System, Acura Navigation System with Voice Recognition™, AcuraLink Real-Time Traffic with Traffic Rerouting™, and AcuraLink Real-Time Weather™ with radar image maps. Other available features include a full VGA 8-inch navigation screen, a rear view camera with three unique view choices, rear entertainment system with a full VGA color screen, an audio system with 15 gigabytes of hard disk drive (HDD) space and USB port connectivity. 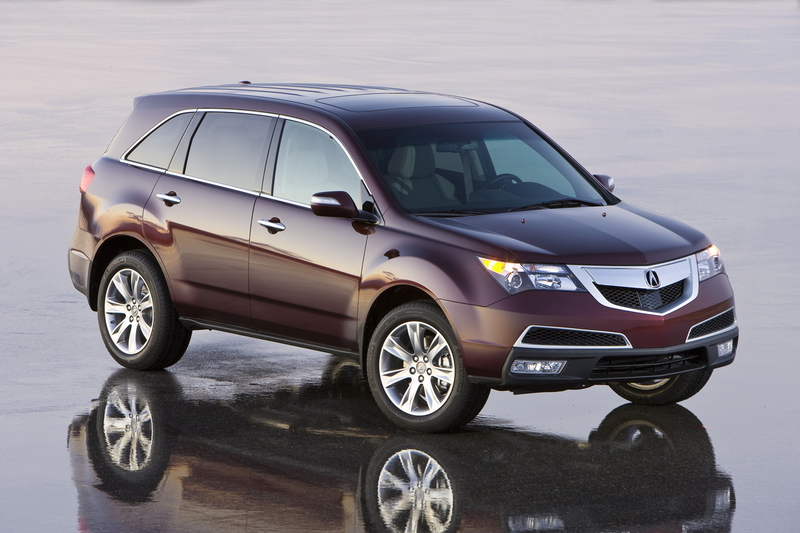 The 2011 MDX is available with an array of cutting edge technologies including Acura's unique Collision Mitigation Braking System™ (CMBS™), Adaptive Cruise Control (ACC), and a blind spot information system (BSI). Power comes from a 3.7 liter, 300 horsepower V-6 that has city/highway/combined fuel mileage of 16/21/18 miles per gallon. The engine is backed by a six speed automatic that has a special multi-clutch torque converter. RDX We think of the RDX as the MDX's "bad boy" little brother. We can envision MDX owners living in contemporary, well-done suburban and exuerban homes that require the long legs and travel comfort offered by the MDX. But the RDX? Strictly fashionable urban condos and lofts--a whole different ballgame. Fast on its feet, aggressive on curves, and thoroughly suited to urban jungles, the 2011 RDX is a turbocharged, sporty and luxurious wunderkind for all those who put aa prority on manueuverabiilty in a reasonably sized SUV. And if you'd like, you can get the Super Handling All-Wheel Drive system, too. 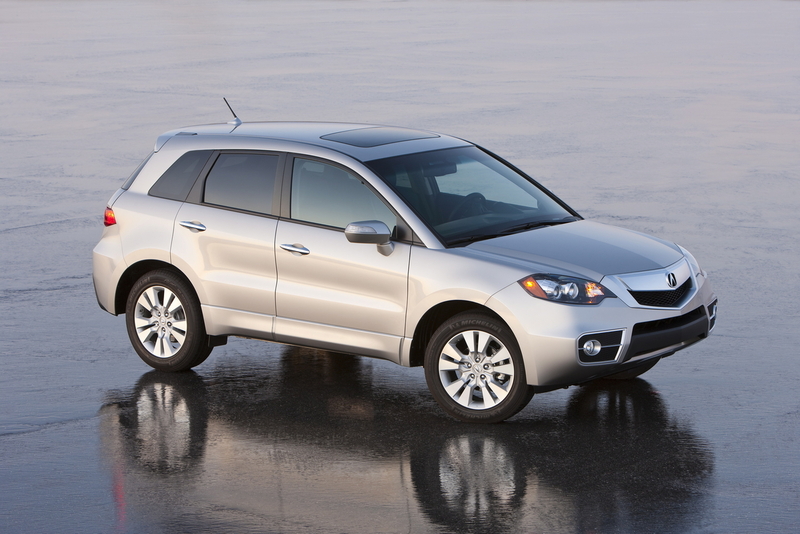 The RDX is available in a less expensive two wheel drive model, if you prefer. "Externally," an Acura news release says, " the 2011 RDX has an aggressive, sporty appearance thanks to bold front and rear fascias, Acura's signature grille, pronounced wheel arches, 18-inch 10-spoke aluminum wheels and upscale trim accents. On the inside, the RDX makes use of a rich blend of leather, artful stitchwork and flowing curves- paired with lots of cutting edge technology." True to Acura's leadership in the application of advanced technology, the RDX incorporates a class-leading array of features that keep passengers informed, entertained and in control. Every RDX features as standard Bluetooth® HandsFreeLink® connectivity with Bluetooth®audio capabilities, a 7-speaker Acura Premium Sound System and a USB port that allows the connection (and charging) of items such as an iPhone® or iPod®. For those who want to be even more connected to the world around them, an available Technology Package includes the Acura Navigation System with Voice Recognition™, AcuraLink Real-Time Traffic with Traffic Rerouting™, and AcuraLink Real-Time Weather™ with radar image maps. Based on Acura's "Safety Through Innovation" initiative, the RDX incorporates leading safety technologies including Acura's renowned Advanced Compatibility Engineering™ (ACE™) body structure, a wide array of airbags (including front, side and side curtain airbags), Vehicle Stability Assist ™ (VSA™), ABS with Brake Assist, and front seats with active head restraints. The RDX is powered by a 240 horsepower, 2.3 lit4er four cylinder engine. The RDX has an EA city/highway/combined fyuel ecnomy ratng of 19/24/21 in a two wheel drive version an 17/22/19 in the all wheel drive model. A little description is in order, by the way, with Acura's cool Super Handling All Wheel Drive system. It differs from other systems in that the optimum torque is distributed not just between the front and back, but between the left and right rear wheels, too. That makes for terrific handling and even better traction than you'd get elsewhere.